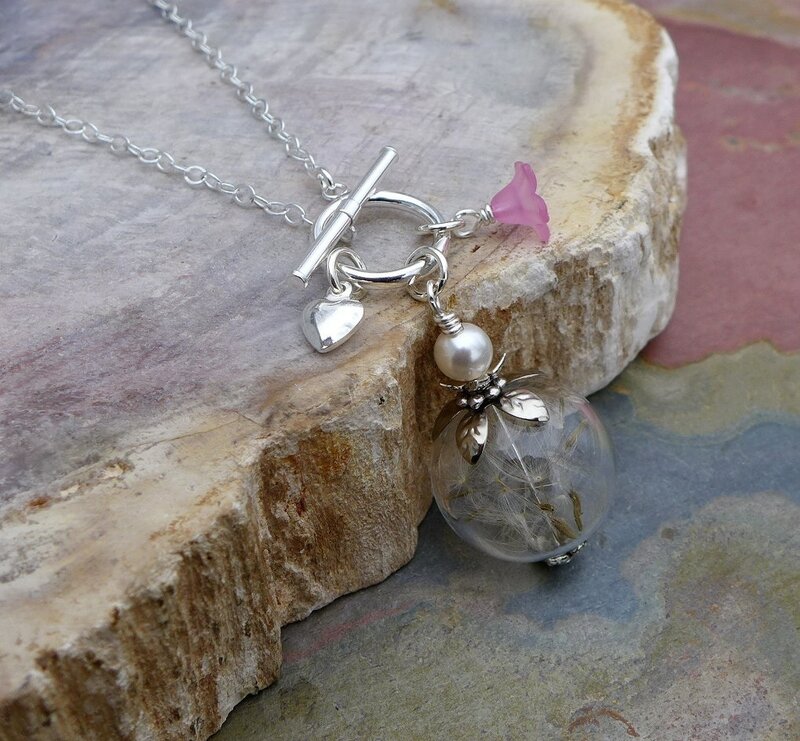 This pretty necklace is made with 20 mm hand-blown clear glass orb filled with genuine dandelion flower seeds. Make a wish by blowing the seeds off a dandelion clock. It was said that that blowing the seeds off a dandelion clock while thinking of the one you love will carry your thoughts of love to them. Carry your wish with you everywhere you go! 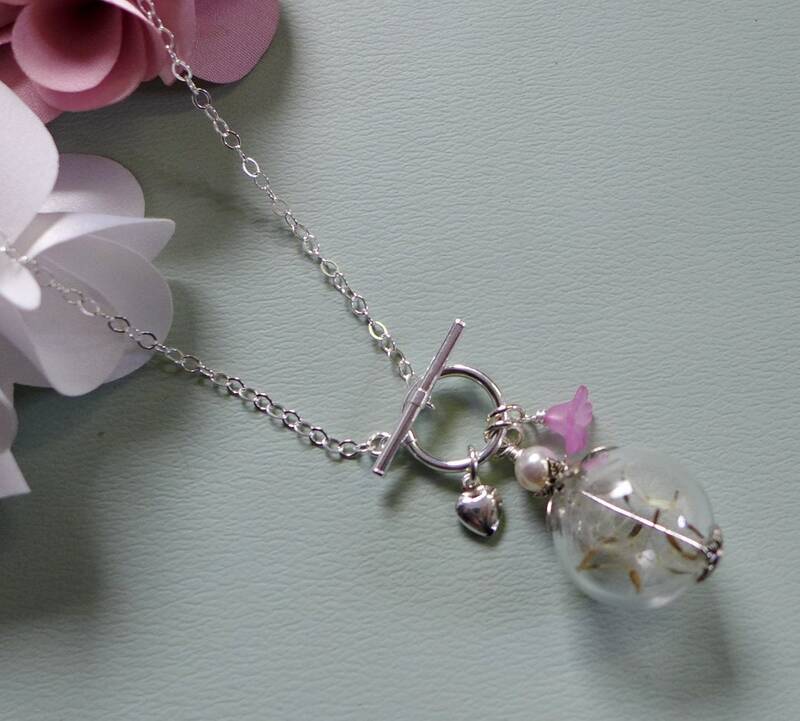 The orb is adorned with silver pewter bead caps, Pearl, small sterling silver puffed heart charm & Lucite flower. 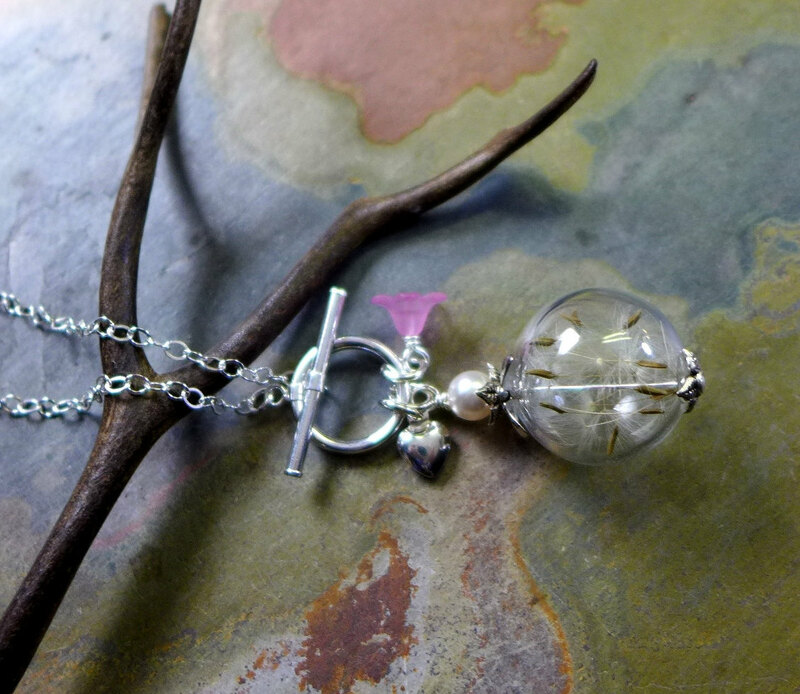 ***The orb pendant is attached to .925 sterling silver cable chain and a fancy .925 sterling silver toggle clasp( toggle ring to measures about 1/2 inch in diameter). It is closed in front. 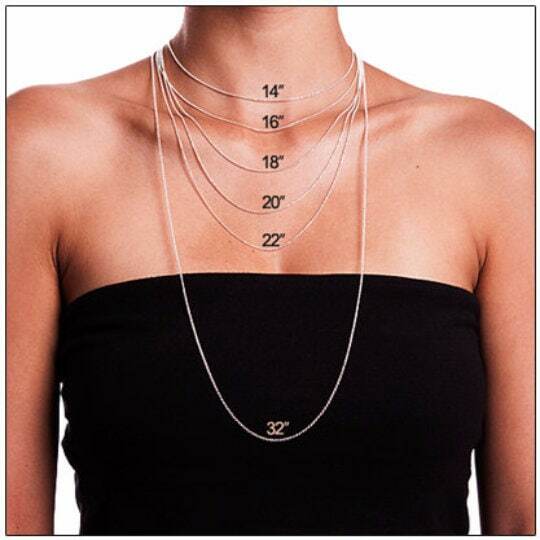 The toggle clasps are a decorative detail in necklaces, adding beauty to function. And toggle clasps are easy clasp. *Different color pearls are available. 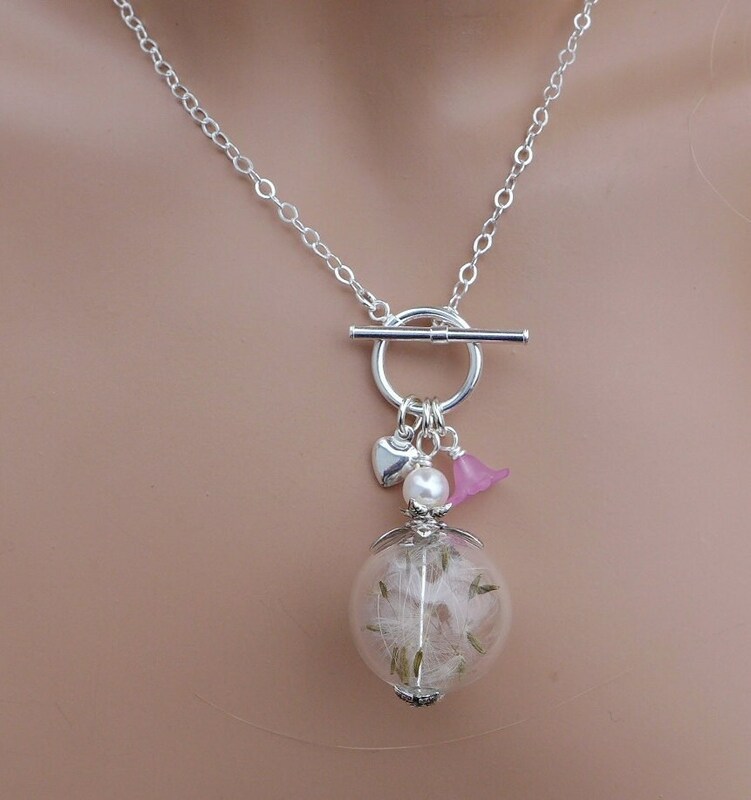 ***They are shipped in a gift box with ribbon. Ready to give as a gift or gift to your self. ***Thank you for visiting my shop. Please convo me with any inquires. 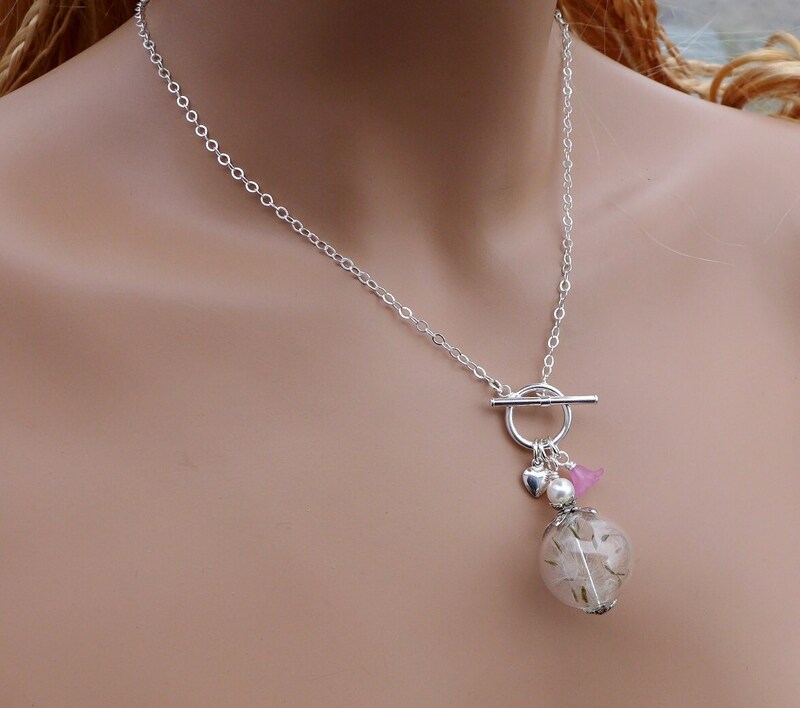 All items are subject to 15% restocking fee if returned since they are handmade. For International buyers, Please read my store policy before place an order. Please email me for any concern. *We ship through USPS FIRST CLASS INTERNATIONAL shipping service which is lowest shipping cost but does not provide tracking information until item arrives to destination. You may want to upgrade to Priority mail INTERNATIONAL service if you would like to receive tracking information.